The holiday period is over — it’s time to get back to work already! As we scale to new heights, let’s look at what the team was doing during the busy holiday season month! We continue to actively work on the development of the Essentia mobile app: both Android and iOS. The latter is now available for download on App Store! Thank you all for the fantastic reviews and feedback! Bitcoin integration. Now, along with 700+ integrated tokens and coins, you can effortlessly send/receive BTC! QR code scanner added. Use the QR code to conduct transactions within seconds. Wallet and Settings modules logic now covered with tests. In order to make the application incredibly more secure, we are now running more tests to eliminate bugs and errors. Application build for the app store: The 0.1.1 version of Essentia for iPhone has passed the Apple review tests and was successfully added to the App Store. Imported wallet encryption with private keys added. We are always working on security, and encryption is one of the essential features of our project. ERC20 token transaction details added. You can now check the addressee, amount of funds to send, and transaction fee in the transaction details menu. Overall, we were also updated and enhanced UI/UX for both versions. Now you can paste your mnemonic phrase without needing to retype it each log in. We have also added the keyboard display to the ‘Send Transaction’ screen and improved the UX of the add token and transaction details screens. For more details on the updates made, you can always check out our weekly reports updated every Monday! This month we also hit another major milestone — the release of Essentia for Desktop! With this application, we now have full interoperability set for the Web 3.0! As we work on adding more functionality to Essentia for mobile and desktop, we can bravely step into the internet of the future. Also, you can now link your mobile account to your computer and easily manage your cryptocurrencies wherever you are; traveling, on holiday, with family, you can always be sure your digital life is secure and under your complete control. Find more on the recent release of Essentia for Desktop in our dedicated post! The main fragments of the mainnet architecture have been built. For instance, the alpha version of the Hybrid consensus based on the Ethereum’s fork (POW) and POS consensus (Prysm) has been realized. We are now testing and ensuring its security and performance. This month we also announced the mainnet release postponement. As we previously stated, we are doing it to conduct proper tests and enhance the network’s security. In order to optimize the blockchain’s efficiency, we have created a special ecosystem which includes the testnet and the additional software such as the creation of various network configurations, account management, registration, and the software for the hybrid blockchain load tests. We are steadily moving towards the blockchain of the next generation, so stay tuned for news, we will keep you updated! Taking on board the suggestions from our community, we are working full time on the synchronization of the mobile apps with the previously released app.essentia.one, as well as Jaxx, Exodus, and other wallets. As always, expanding the functionality of the application is our top priority — we keep adding more currencies to our list. Just like the Essentia mobile application, we are working on adding the functionality of having an easy and efficient migration from app.essentia.com, saving key generation paths and settings in the process. 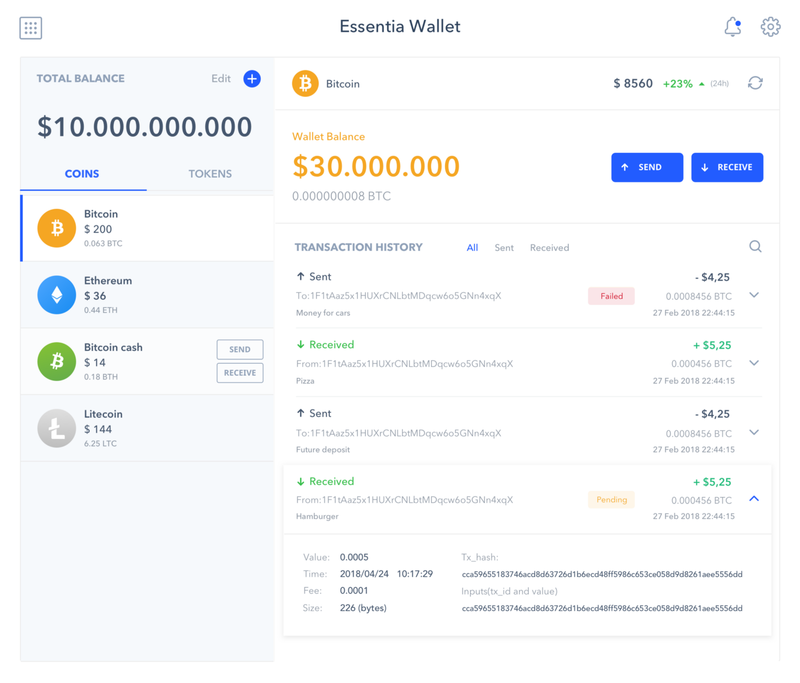 We are also adding a list of various wallets for easy access to funds and management through Essentia. The team is also preparing a desktop version that will be listed on the App Store — so stay tuned! We have already begun working on updating the existing aspects of the network, such as improving security/speed/decentralization via various algorithms integration, as well as the optimizing the private keys management. We are also beginning to adapt and optimize the shard structure according to the new functions and characteristics that are being added. As always — if you have any comments or questions, feel free to reach us on any social media outlet!